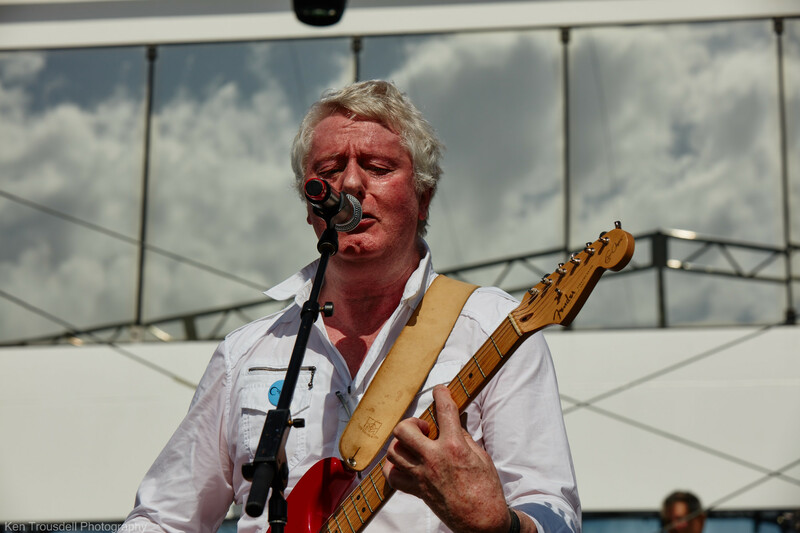 The Rock Club recently caught up with Pye for an exclusive interview ahead of Caravan’s January 2013 UK tour. Hi Pye, how are you today, ready for Christmas? The turkey and the ham are ordered, the champagne is already on ice, the Christmas tree is up and covered with decorations. The house is nestling under a couple of inches of snow, and I have uncharacteristically bought the main presents, so I am nearly ready. Just the surprise pressies to go. Today up here in the Grampians, it is cold. Yesterday it was snowing and cold, and tomorrow it will be wet and cold. If the sun comes out it will be a full house of weather. This year will be a quiet one ,I expect, as my son and his family will not be joining us until after Xmas. You have a 10 date UK tour planned for January around the ‘For Girls Who Grow Plump in the Night’ album. Is this aimed at the Grey hair fans from the 60’s & 70’s or do you hope to attract some new followers? Caravan fans are a completely mixed bunch. Some are clearly our age group with as you say Grey Hair ( I prefer to call them Highlights), some are bald, (That’s when we have to get out the shades to avoid the glare), and some are young and discovering the music for the first time. Whatever, they are like family to me and I love playing to them. They are the most loyal bunch in the world. 45 Years and counting. 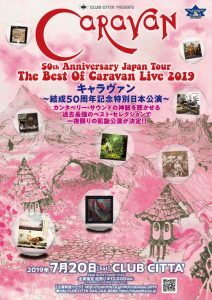 When did you realise that music would be your path for life and when and where was your first gig as caravan, any memories? I realised music was going to be my preferred course in life about two weeks after I got my first guitar on my 17th birthday. I was a late starter. Once I had learnt a couple of chord patterns I was completely hooked and couldn’t put it down. It is still the same today. The first Caravan gig that I remember was in the Beehive club in Canterbury. This was “The Place” to be in those days. It was referred to as a Coffee Bar and no alcohol was served. We went across the road to the Nag’s Head pub to get in the mood before playing. The beehive was very small with a capacity of no more than 100 or so, but the atmosphere was heaving. We had individually played there before in the Wilde Flowers band doing R&B so the crowd knew us and were prepared to give us a chance with our own music. It went down a storm and we were invited back on a regular basis. Creatively just how good was it in the early days – and how does that compare with the line-up /reunion today? Are there any plans to record new material with the current line-up? Creatively it was brilliant in those days, because we were all young and had just discovered the joys of writing our own material, and finding out it wasn’t complete rubbish. Of course this was helped by the audiences being receptive to us trying out different things. Like every walk in life, you learn from your mistakes and you adapt very quickly if you are to survive. Some audiences can be very unforgiving in their appreciation, so you learn what works and what doesn’t. The line-up today is vastly more experienced in that we have all been round the block a couple of times, so when it comes to the rehearsal of new material the end product is realised with the minimum of time wasted and is consequently much more enjoyable. Yes, the plan is, once this tour is done, we should record a new CD. I am working on about Ten new numbers of which I will squeeze a couple into the set for this tour to try them out for audience reaction. It also gives us the invaluable experience of ironing out the lumpy bits in the new songs before we get to the recording studio which saves time and money. What was the inspiration for heading out on road again next year? There was no specific inspiration to tour at this time, apart from the fact that we have been playing quite a few festivals in Europe etc., and our agent thought it about time that we did a run of dates in the UK. I am happy to tour all year round. Are you in contact with any contemporaries from the 70’s still making music? Living where I do in the north of Scotland, I don’t get to see many of our contemporaries playing. We catch up sometimes at festivals where we are on the same bill but never enough time to chat or anything more than that. If you could do it all again, is there anything you’d change? Back to school/college days, what were the hot records exchanged with fellow students as you went through the education system? The hot records exchanged were The Beatles, Kinks and the Stones like everyone else plus some Mothers of invention, Steely Dan and Weather Report. Add to this a spattering of Miles Davis, Duke Ellington, Bill Evans and Thelonious Monk. What is the best piece of advice you can you give to new bands taking their first steps into the music industry today? What do you listen to nowadays – and what do you think of current music citing the ‘Canterbury sound’ as an influence? Who gave you the moniker of the ‘Canterbury sound’ in the first place? I always have, and always will, listen to as many kinds of music I can access. I get inspiration from all sources and don’t have a favourite type apart from a strong leaning towards Rock. Listening to a good rock band in full flight is still the most thrilling sound to me. The Canterbury Sound moniker was originally attributed to Caravan and the Soft Machine and was invented by journalists who wanted to pigeon hole us. Because we had a slightly jazzier approach to our songs, and came from Canterbury, this probably made us slightly different from our contemporaries. Garron Frith is on the tour with you in January, what can you tell us about his music? 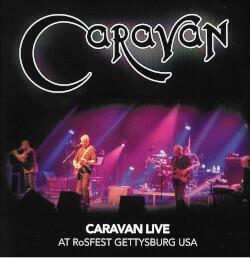 Caravan performs the 40th anniversary of their 1973 album “For Girls Who Grow Plump in the Night” at the Falmouth Princess Pavilion Saturday 19 January 2013. 24 Box Office: 0844 478 0898. Dates include London Queen Elizabeth Hall (Jan 8), Cambridge Junction (Jan 9), Wolverhampton Robin (Jan 10), Sage Gateshead (Jan 12), Edinburgh Queen’s Hall (Jan 13), Salford Lowry (Jan 14), Bridport Electric Palace (Jan 16), Bath Komedia (Jan 17), Tavistock Wharf (Jan 18), Falmouth Princess Pavilion (Jan 19). This entry was posted in Interviews on December 17, 2012 by caravan.